More links for "GeForce GTX 1080 "Founders Edition" 8192MB GDDR5X PCI-Express Graphics Card (GV-N1080D5X-8G"
Ordered the Palit edition of this card. Same cooler, PCB etc and 2 water blocks. Yes I'm planning SLI. I've always had SLI cards stretching back to the 660 but for once I don't feel its needed at all. I have a 144hz 1080p G-Sync monitor and it hits that on every game I've thrown at it. Under water I hit 40c and overclocked to 2075mhz. 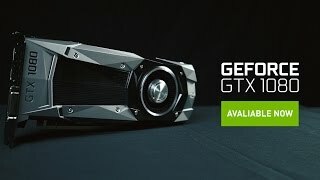 As driver releases come out I'm expecting more and more from this card, and the GTX 1070. I will be going SLI from Sat 2nd July as OCUK will be getting another order for a reference 1080 and I can't wait. Just what I'd been hoping for! Did have an EVGA SC on order but seeing as EVGA kept delaying delivery I decided to just go and buy the first non EVGA card I could find and I DEFINITELY made a good decision - I've managed to overclock this card to 2100mhz WITHOUT A CUSTOMER FAN CURVE AND IT NEVER EXCEEDS 78-79 DEGREES! For those interested, 96.6% ASIC quality... Never seen anything this high before! But anyway, the build quality of these new 'founders' (reference) cards is insane, solid as a brick and absolutely gorgeous to boot. Don't be put off by the reference cards this time around as it seems that they are performing just as good as the aftermarket cards, even with customer PCBs! Nvidia did something crazy this year, not sure what (maybe GPU Boost 3.0?) but reference cards are damn good this time around - it's just whether the blower style cooler is ok for you - I find it quieter than my old 980 too. Efficient, powerful, pretty and fairly quiet too - could literally not be happier with my purchase. Ordered my card at 2:30 on release day, came at 9AM the next morning. Card is great, doesn't overheat too much in my case and gives great performance. Great service as always, OCUK.